The Ticket Holder acknowledges that the Showground areas are subject to strict security arrangements and that the Organisers may carry out security checks (including, but not limited to, checks of the Ticket Holder’s person, belongings and vehicle) and refuse entry to, or remove any person and/or vehicle. The following items may not under any circumstance be brought onto the Showground: explosive substances or materials, pyrotechnics, offensive weapons and firearms (including replica or toy firearms), projectiles and similar devices; placards, flags, banners, signs, brochures and leaflets intended for distribution to the public; megaphones, amplifiers, loud speakers, lights and laser pointers; paint, chemicals, spray cans and other associated apparatus, barbecues, birds or animals (including any within vehicles in the car parks) except assistance dogs and any other item which, in the opinion of the Organisers, may cause personal injury or property damage, disruption to RAF Cosford Air Show, public nuisance or inconvenience, offence or distress or is deemed to be a security risk. The Ticket Holder shall not without the Organisers’ prior written consent sell, license, or otherwise exploit, or attempt to exploit, any material whether written or in the form of digital or photographic film, sound, video or other recording or computer software obtained or made at the Showground. Organisers reserve the right at any time to cancel or postpone RAF Cosford Air Show or to cancel, postpone or vary any event comprising part of RAF Cosford Air Show. The Organisers shall not be responsible for any indirect or consequential loss, howsoever arising, including, without limitation, loss of profits or loss of contracts arising from such cancellation, postponement or variation. 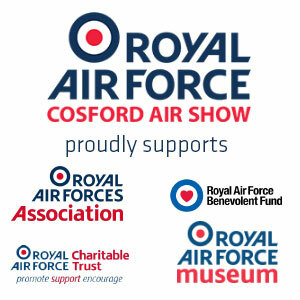 The Ticket Holder will not be entitled to a refund of any entrance fee paid if for any reason outside the Organisers’ control RAF Cosford Air Show or any comprising element does not take place or is curtailed in any way or postponed or the Ticket Holder is prevented from attending RAF Cosford Air Show. Should weather or other circumstances require flying to be curtailed or restricted, where possible aircraft will be taxied and other showground exhibits and displays will be available. The Ticket Holder shall not sell or transfer or attempt to sell or transfer this ticket to any third party with the exception of our nominated ticketing partner, SEE Tickets, without the Organisers’ prior consent. Unaccompanied minors (under 16) are not permitted entry to the Air Show. Due to the limitations of our grass car parks and the trackway we employ, vehicles over 7.5t or 7m in length are not permitted in the car parks. Visitors entering the airfield do so entirely at their own risk. No liability will be accepted by The Secretary of State for Defence, the Ministry of Defence, Royal Air Force, Royal Air Force Cosford, the Organising Committee of the RAF Cosford Air Show, their consultants, servants, agents, independent contractors or sponsors for any injury (including fatal injury), illness, damage or loss whatsoever directly or indirectly occasioned to person or property, whether due to negligence or otherwise howsoever caused subject to the provisions of the Unfair Contract Terms Act 1977. The operation of Unmanned Ariel Vehicles/RC Drones within a five miles radius of the airfield is prohibited under Restrictions of Flying Regulations which have been established under Article 239 of the Air Navigation Order 2016 at this location. Therefore, the flying of an Unmanned Ariel Vehicles/RC Drones constitutes a criminal offence. These Terms and Conditions may be modified by the Organisers by notice prominently displayed at the Showground entrance for the RAF Cosford Air Show. These Conditions do not create, confer or purport to confer any benefit or right enforceable by any person not a party to them. If for any reason any provision of these Conditions is held to be invalid, illegal or unenforceable, such provision shall be severed and the remainder of the Conditions shall continue in full force and effect. These Conditions shall be governed by and construed in accordance with English law and the Ticket Holder agrees to submit to the exclusive jurisdiction of the English courts over any matter arising under or in connection with these Conditions. When approaching the showground follow the yellow event directional signage. Do not use satellite navigation when approaching the showground. Caution must be taken when driving in the showground, on site speed limits must be obeyed and drivers should be aware of pedestrians in the car parks. There is a limited amount of off base car parking to the North East of the airfield. Our traffic management team will adapt to the conditions and flows on the day, therefore we can never guarantee where cars will be parked. However, the majority of vehicles coming from the East and South will be on base, and those coming from the West and North will be equally split between on and off base. Please note that those parked in the off-base car park are likely to benefit from a speedier entry and exit than those on base. Gate 4 (exit off the A464) will only be open from approximately 0830 until approximately 1100 during the inbound phase. This gate will not open for departures until the flying display has finished which will be approximately 1800. All vehicles arriving through Gate 4 will be parked on base. If you have arrived through gate 4 and need to leave the event before 1800, you must make your way to Gate 2. Please expect some delays if you do need to exit before 1800.